Children with animals are more likely to have higher self-esteem; a US study of 394 university students showed that those who had cats and dogs as children were more self confident than those who didn't. 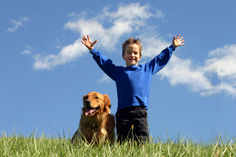 Children with pets have significantly higher attendance records at school because they are ill less frequently. Grandparents and children can laugh together over the antics of pets and animals - giving both generations a sense of wellbeing and fun! Pets are a great way to link the generations. Children and their grandparents and family friends can discuss their pets - their grandparents may have many fond memories of the animals they had when they were small. Pets are great listeners - many children revealed in one survey that it was their pet they went to with problems rather than their parents! Pets are loyal, loving friends - they don't criticise, judge, interrupt, tell how it was in their day, assume they know how the other is feeling...they just listen and offer quiet symapthy. And children know that whatever they tell their pet, he won't tell on them! Boys may prefer the kudos of dealing with the scarier side of pets, such as having contact with snakes, frogs and the like - Froglife can suggest interesting ways to sepnd an afternoon! In a world where there is so much emphasis on being hygenic and safe, children need to experience risk and adventure. They need to know that they can handle it, even if mum is close by with a box of tissues afterwards. (For first aid kits, click here.) Kids love exploring and finding out. Of course, a young child should never be left alone with any animal - you just don't know what the child may do to provoke him or her, unknowing as they are. Pets teach children a lot about behaviour and respecting the needs of others. A child will soon learn when a pet has had enough, and that they need some quiet time. He or she will learn how to treat animals well - and consequently people. Pets teach kids a lot about responsibility. Children learn how to look after someone and how to think of the needs of others. Essentially, children learn the skill of caring. The physical activities involved in looking after many pets - cleaning out cages, mucking out, grooming, walking, feeding and watering - all involve some form of exercise, be it stretching, bending, walking. This is all good for a TV-and-PC focused generation! And the pet makes the child feel important, wanted, needed and gives him or her a sense of pride. The death of a pet introduces children to this very important experience in life - that is, the death of a loved one. When the time comes,the Blue Cross and the Society of Animal Studies run the Pet Bereavement Support Service with booklets and trained counsellors. Don't tell your child that a pet has "gone to sleep" because a) your child may take it that the animal is coming back and b) they may in turn be afraid to fall asleep in case they don't come back, either. Most of all, pets are magic! They share our ups and downs, our successes and our failures; they are always happy when they get up in the morning, no matter what the weather. And they will always welcome a child home from school. The right pet teaches children a great deal - research is important. Many animal charities have pages for kids and also plenty of advice for those parents seeking pets, with information packs about choosing a pet, and some of this will focus on pets for children. A good vet will also be able to help you. Some pets are better in pairs; others aren't necessarily as good with children as the immediately appear, although this can vary from breed to breed and species to species. Get advice if you're unsure.